Tom Hanks. Audrey Tautou. Ian Mckellen. Alfred Molina. Jurgen Prochnow. Paul Bettany. Jean Reno. Action/Adventure. Thriller. Mythology. Religion. Police. Architecture. Detectives and Private Eyes. Murder Mystery. Have any of you managed to dodge the book? Well for those lucky few the basic outline has symbologist Robert Langdon in search of the Holy Grail and Jesus Christ's last living descendant. Unfortunately for the unwitting Robert the shadows are littered with fanatical secret religious societies and before he knows what he's stumbled across he's running for his life, helped by the rather more able cryptologist, Sophie Neveu. 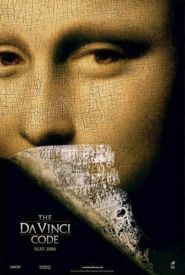 The Da Vinci Code is a very big budget action adventure; ridiculous, overly long, and with an unintentionally hilarious script its sole redeeming feature is the relentless pace� the pre-requisite of any action flick really.